PURCHASE THE AD-FREE PDF PATTERN FOR THE CHUNKY CROCHET BEANIE HERE ON RAVELRY. OR SCROLL DOWN FOR THE FREE CHUNKY CROCHET BEANIE PATTERN. It’s officially beanie season here and I love it! I just love a nice chunky, crochet hat in a neutral color that can match anything I’m wearing! 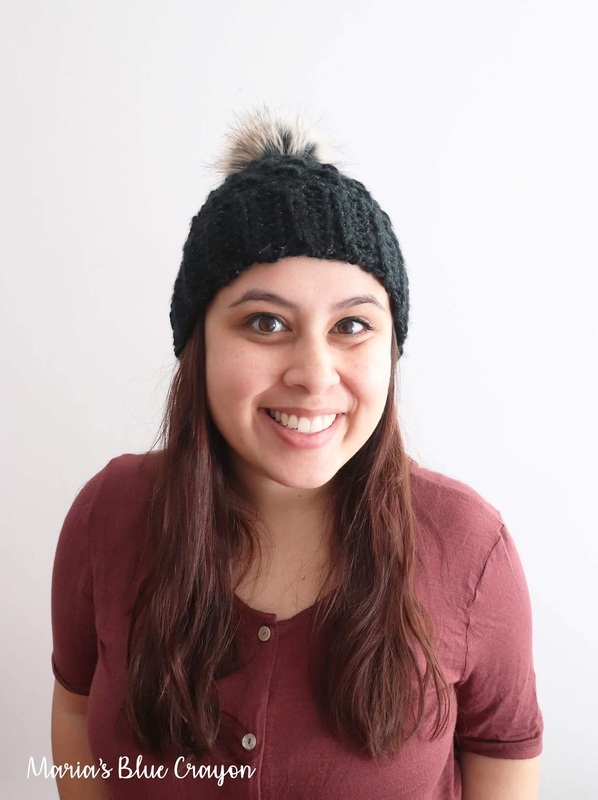 I also love quick and easy crochet hats and this one is just that! It took me just one sitting to complete this chunky crochet hat – it’s really that quick – just the brim and 9 rows after that! PLUS there is even a messy bun version if you like those! Find the messy bun version here – if you purchase the PDF, both versions are included! The messy bun version is actually one of my first patterns on my blog. I’ve been meaning to get new photos of it on the blog, but when I made a new sample I decided I wanted to close it up and put a pom pom on it! Because although I do wear messy buns a lot, I always like a closed hat option as well. I actually ended up making a handful of samples with different yarns to see what I liked best. 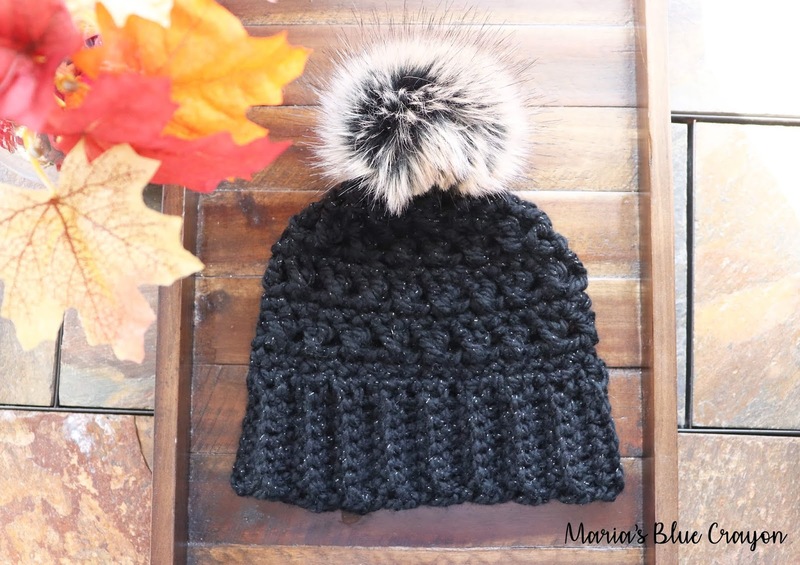 My original messy bun hat was made with Bernat Chunky, which holds up well but isn’t the softest in my opinion. This time around I used Loops and Threads Charisma, Loops and Threads Kaleidoscope, I Love This Chunky! (pictured), and Lion Brand Wool Ease Quick and Thick. My favorite? The I Love This Chunky! It’s not stiff, very flexible and overall I enjoyed working with it and I loved the metallic flecks in it. Loops and Threads Charisma is also very very similar to this yarn so I would say it’s a close second. 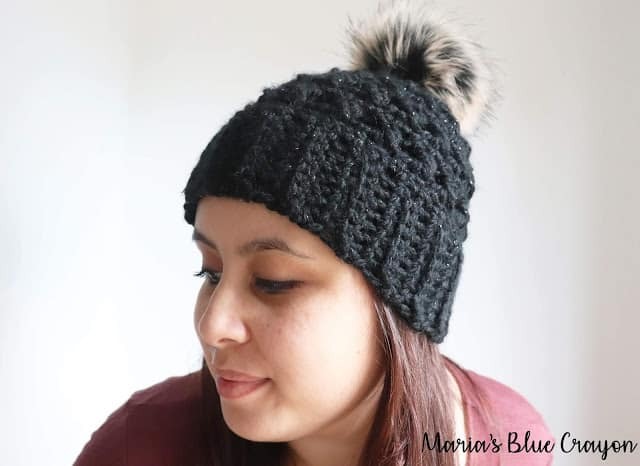 I would recommend using any of those yarns although Lion Brand Thick and Quick is a bit thicker than the other yarns I used so the last row of the hat was not needed when making the messy bun version. PIN it to your crochet boards on Pinterest! Sharing in any way really helps my blog keep going and the free patterns coming – thank you! Click here for the free pattern for the Crochet Messy Bun Version. We will be starting with the brim of the hat and working our way up. Continue doing this until you have 35 rows. Once you have the brim finished, fold it in half so you can slip stitch the ends together. We will now begin working in arounds on the side of the single crochet rows we just made for the brim. Sew up opening by weaving needle in and out of the top stitches.